Climate Change March – So what is next? WASHINGTON, D.C.—On President Trump’s hundredth day in office, a flood of protesters—fearful of more literal floods to come—deluged the nation’s capital. 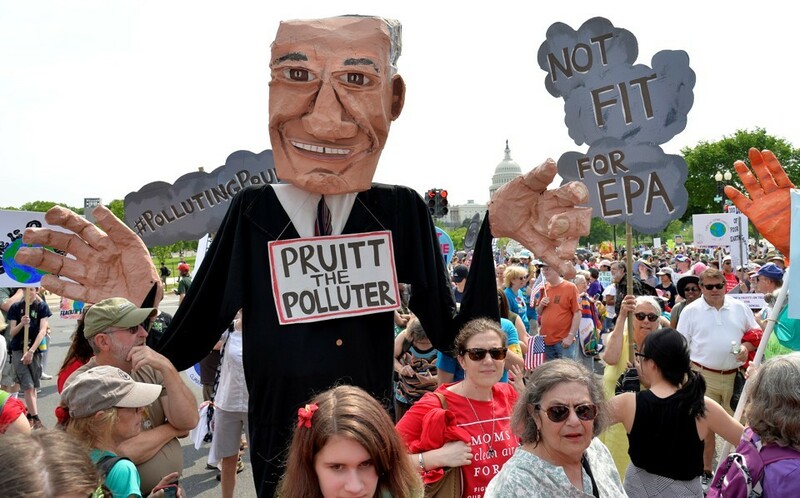 Tens of thousands of people filled downtown Washington on Saturday to protest the Trump administration’s environmental agenda and the decades-long history of American inaction on climate change. Over the course of a sweltering 91-degree day, they shut down Pennsylvania Avenue, surrounded the White House in a massive sit-in, and rallied in front of the Washington Monument. “What do we do when our communities are under attack? Stand up, fight back!” said Dallas Goldtooth, an organizer with the Indigenous Environmental Network and one of the emcees of the rally. 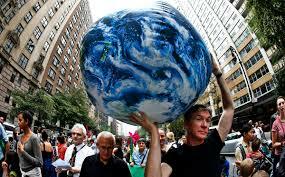 “We had to come down for this—climate change is the most important issue of our time. But then we bought carbon credits to make up for it,” said Deborah Markowitz, the former Vermont secretary of state and a current professor at the University of Vermont. She marched with her daughter and her husband—whom she met, 35 years earlier, at the 1982 protest against nuclear weapons in Central Park. Archana Dayalu, a doctoral student in atmospheric chemistry at Harvard, also came down from New England to be at the march. She had rallied the previous week at a March for Science event in Boston. “If you’re in your first few years of grad school, you can lull yourself into a false sense of complacency. You think, the work’s getting done. As long as I’m researching, I’m getting work done. But if you step out of that zone, you realize how little of your research is being translated into meaningful action,” she told me. “I don’t think that I can solely be a research scientist anymore. If it’s an issue of this much importance, I need to show that action as well as research is important right now,” she said. 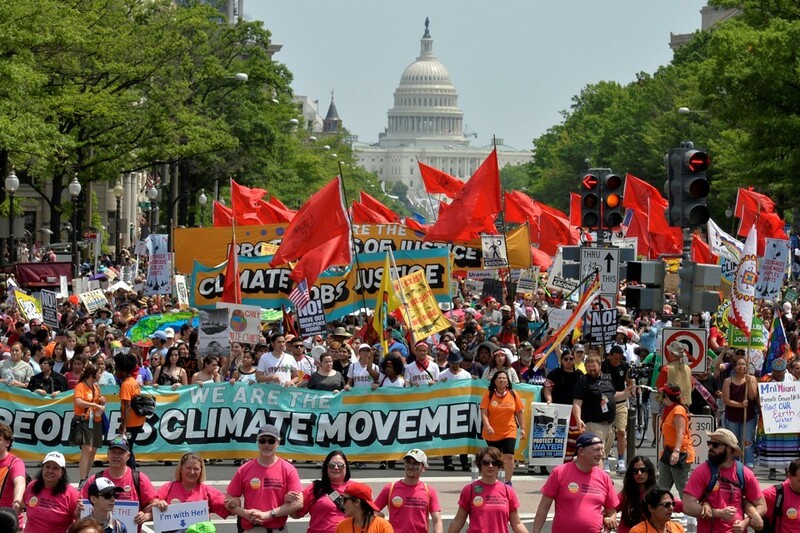 The event is officially called “The People’s March for Climate, Jobs, and Justice,” a title that nods to the range of issues organizers worked to draw together under the banner of climate change. This breadth has been key to the relative popularity of the People’s Climate Movement, the organization which hosts the march, which drew a larger crowd than last week’s March for Science, despite getting less media attention. It has also eclipsed the size of Bush-era protests against global warming, which were led by more traditional environmental groups, like Greenpeace. Yesterday’s march did not specify an ideal climate policy, instead allowing individual groups to advocate for their own proposals. As a result, they were able to pull in attendees from racial and indigenous justice groups, labor unions and other modern left campaigns like Fight for $15, and Democratic Socialists. Along with the fights over the Keystone XL and Dakota Access pipeline—which were led by many of the same organizers—it constitutes one of the few organizational bright spots in the long and ineffective history of U.S. climate activism. (Whether it will lead to any genuine political victories remains to be seen, of course.) The People’s Climate Movement has also worked to build up local grassroots support: Since 2014, it has sponsored regular meetings across the country that allow local labor, social justice, and environmental groups to meet and organize together. The rally was hosted by Goldtooth, who is Diné and Dakota and who was prominent during the Dakota Access fight, and Carrie Fulton, a black environmental-justice organizer in D.C.
At the march itself, the weather proved resonant. The blazingly hot day tied the daily record for April 29 in Washington, forcing elderly marchers to sit and rest in the shade trees lining Pennsylvania Avenue. But the more significant record fell the night before, when temperatures failed to drop below 70 degrees overnight. As The Washington Post notes, that had never happened before in D.C. in the month of April. Many of the marchers were older. Lois and Al Howlett participated in the first Earth Day protest in 1970; they came down from Yarmouth, Maine, to be in this one. (“Married 45 years!” Al told me.) Jared and Latosha Catapanos, a more recently married couple, walked with the Washington, D.C., teachers union. Jen Foster from Frederick, Maryland, towed her kids behind her—ages 11, 9, 6, and 4. And beneath a sign saying “CO2 Is Hurting My Oyster Farm” stood Bill Mook, 63, who has spent the last three decades running a sea farm at the mouth of the Damariscotta River in Maine. Ten years ago, he started to lose thousands of oyster larvae every year as the water in his hatchery acidified past their survival point. He has since figured out how to work around that problem, but now he and his small staff are dealing with another one: They must immediately chill oysters after harvesting them to keep them from catching human pathogens in the warmer ocean waters. Whether the protest will eventually result in political success is an open question. 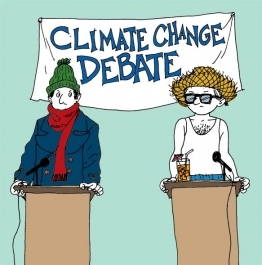 Due to the hyperpolarized politics of climate change, it may ultimately depend on other factors—whether the Democratic Party can harmonize a political message, for instance. And the lack of any one unifying climate policy may prove troublesome when it comes time for the movement’s leaders to govern again. But protests are not only about legislative success. The March for Life has gone on for decades and Roe v Wade remains the law of the land. Rather it is for people to register their mass discontent and mobilize around a movement’s shared goals. For the moment, the People’s Climate Movement seems to have accomplished that.